AirAsia Deputy Group CEO (Airlines) Bo Lingam said, “Thank you everyone who voted for us. Over the past year, we have worked hard to improve customer experience to make travel more convenient and fun, while also personalising the end-to-end journey, and it’s incredibly rewarding to see our work pay off like this. “In addition to a slew of digital initiatives, such as our Fast Airport Clearance Experience System (FACES) facial recognition boarding system and Freedom Flyer Programme, we’ve built up our Customer Happiness team to ensure we continue to improve on our ability to serve and amaze our guests, who demand frictionless, responsive customer support at a touch of the button on the go, and we are working hard to deliver that. AirAsia Group Head of Cabin Crew Suhaila Hassan said, “I’ve been with AirAsia for 22 years. I joined as one of the first cabin crew hired, even before Tony and Datuk Kamarudin bought over the airline. We were small then, with only 30 cabin crew and two planes operating domestic Malaysian routes. Of course, since then, the company has grown, and so has our family. We now have more than 5,900 cabin crew from all over the world, including Australia, Brazil, Zambia and the US. The World Travel Awards is one of the most prestigious, comprehensive and sought after awards programmes in the global and tourism industry. 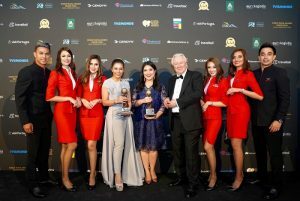 Established in 1993 to acknowledge, reward and celebrate excellence across key sectors of travel, tourism and hospitality industries, the World Travel Awards brand is now recognised globally as the ultimate hallmark of industry excellence.